11/10/10: Jack is a 7-year-old boy with a recent history of decay. His parents had been taking him every 6 months for his dental checkups and cleanings, and they were frustrated with the decay at his last few appointments. Jack’s only risk factor reported was plaque buildup between brushings, and his parents said they participated in Jack’s daily home care and monitored his food and drink intake fairly closely. Jack had had 2–3 new cavities every year in the last couple of years and “freaks out a bit” because he was scared every time he came to the dental office. Everyone in the dental office remembers Jack, and he and his family were extremely frustrated with his continuous dental decay. His dentist thought of Jack when she implemented a new caries risk assessment and testing program and wasn’t surprised that Jack’s first CariScreen score was 8894 and at this appointment had 5 new cavities. After some conversation with Jack’s mother, the dentist discovered that although the mother had not marked it on the CRA form, Jack also had other risk factors such as frequent snacking as well as drinks other than water more than 2 times daily. The mother had not shared that information on the CRA form as she didn’t think the fruit, vegetables, cheese, raisins, milk, apple/pomegranate juice, and other healthy snacks Jack was snacking on daily “really counted.” She thought they were only asking about soda and candy consumption. Jack’s dentist shared how the pH in Jack’s mouth was basically always low due to the frequency of his eating, drinking, and snacking; and this had caused the bacteria in Jack’s mouth to become out of balance. The mother did not want to take away Jack’s snacks as she felt it would be too much of a change in his daily routine and chose to add a 0.2% sodium hypochlorite antibacterial rinse with xylitol, pH neutralization, and fluoride to his daily home care program. She did not opt for the recommended 1.1% neutral sodium fluoride gel with pH neutralization, xylitol, and nanoparticles of hydroxyapatite for remineralization because she said Jack really liked using his “sparkly blue movie car” toothpaste. The dentist informed the mother that the antibacterial rinse did not taste great and that she would have to work with Jack to make sure he was using it twice a day for then ext 6 months. 6/22/11: Jack came in for his 6-month checkup, and his CRA form revealed a new risk factor. Not only did Jack still have the other three risk factors of plaque buildup between brushings, frequent snacking, and drinks other than water more than 2 times daily; but he was now on a daily allergy medication that might be causing some dry mouth as he had increased his juice consumption. His CariScreen score was 9999, and he had 3 new cavities. His mother was frustrated and had informed Jack’s hygienist that the antibacterial rinse wasn’t working. After a thorough conversation with the mother, Jack’s dentist discovered that Jack was only using the rinse a couple of times a week and the mom admitted she simply didn’t like trying to get him to use it because, like his allergy medication, he “didn’t like it.” The dentist informed the mother that if they wanted to get his decay under control, something was going to have to change; they should choose one major change to Jack’s routine and stick with it for 6 months and then reassess if more changes were necessary. The mother really did not want to change his eating/snacking routine as it really helped keep Jack busy, especially when his medication made him hyper. The mother chose to move forward with a professional home care kit for high/extreme-risk patients that covered all of the bases of antibacterial (0.2% sodium hypochlorite), fluoride, xylitol, pH neutralization, and nanohydroxyapatite for remineralization. 12/12/11: Jack returned for another 6-month checkup, and his mother only reported two risk factors, frequent snacking and drinks other than water more than 2 times daily. She said his plaque between brushing wasn’t happening anymore and he was off the allergy medication during the winter. His CariScreen score was 2247, and he only had one very small cavity that had formed around an old filling. Both he and his mother had been using the professional products that had been recommended (she was also high/extreme risk), and Jack was excited to be using the “same toothpaste as his mom because he was a man now.” The mother also mentioned that her mouth felt much cleaner and her gums had stopped bleeding when she flossed. She chose to continue using the professional home care kit (for both her and Jack) rather than changing Jack’s eating and drinking habits. 6/2/12: Jack had no new cavities at this checkup! His CariScreen score was 2420, and his mother kept working diligently with him on his home care rather than changing his diet. They continue to use the professional home care kit with antibacterial (0.2% sodium hypochlorite), fluoride, xylitol, pH neutralization, and nanohydroxyapatite for remineralization every 3 months for Jack until everything is in balance or they choose to make dietary changes. 7/12/11: Sheila is a 36-year-old hygienist who works in a large group dental practice. While training on the CariScreen Caries Susceptibility Test, which was new technology for their practice, she and one of her fellow hygienists performed practice tests on each other. While Sheila had a few cavities as a child, she had not had any decay for many years and was “fanatical” about her oral hygiene. She was flabbergasted when her test showed a result of 9232. She shared that she did have a couple of risk factors in that she did take a couple of medications and was on a diet that required 5 small meals a day and one snack. Her CariScreen trainer shared with her that the CariScreen doesn’t know if you are a hygienist, a dentist, or a bank robber. It provides an unbiased reading on the amount of biofilm ATP collected from the teeth. Sheila decided that she wanted to have the dentist check her out as it had been 10 months since her last x-rays. Upon inspection and x-ray, her dentist found two very early lesions forming between her back teeth. The dentist shared that she took a “hard look” at the x-rays knowing what Shelia’s biofilm challenge was and identified the early decay. But the lesions were not big enough to necessitate fillings at this time, and Sheila could try remineralization therapy first. As Sheila processed the information, she began to connect the dots and realized that starting that extra medication 6 months ago, combined with the new diet 4 months ago, might have had an effect on her risk for decay, but she had made no changes to her oral care routine. She decided to attack the issue head-on and started professional home care kit with antibacterial (0.2% sodium hypochlorite), fluoride, xylitol, pH neutralization, and nanohydroxyapatite for remineralization that day. 7/30/11: Sheila called to inform her trainer that she had been using the professional home care kit for a couple weeks and decided to have another CariScreen test. The CariSceen reading was 9987, and she was concerned that the products weren’t working, although her teeth did feel cleaner. Her trainer shared that it might be too early to see results and that she needed to finish the kit and retest at 3 months. Sheila decided to keep with it. 10/16/11: Sheila had another CariScreen test done by one of her coworkers, and her score was 4389. She was glad to see it had come down. Her dentist wasn’t able to perform another x-ray at this time to check on the status of the early decay that was identified, so they decided to wait until 6 months. Sheila decided to keep up the professional home care kit and added an oral spray with pH neutralization and xylitol during the day after her meals and snack to elevate the pH in her mouth after eating her 5 daily meals and snack. She also shared that she had lost 7 pounds on her new diet. 2/4/12: Sheila had another CariScreen and x-rays performed. Her dentist said that her early decay appeared to have remineralized, and Sheila was very happy about that. But what she was most excited about was that her CariScreen score was 1610. Although it was a bit above the threshold, she was confident that a good home regimen with a professional home care kit including pH neutralization, xylitol, fluoride, and nanoparticles of hydroxyapatite and using the mouth spray after meals and snacks could keep her biofilm challenge down. She also said that she was planning a full “cosmetic dental makeover” for this summer. Being a hygienist, she had always wanted “perfect teeth.” But she had always been worried about investing in a makeover for her teeth as she had seen people both with decay and without decay have full cosmetic makeovers and come back a year later with a new decay and their beautiful dental work breaking down. But now she was much more confident she could keep her risk in check, and after a divorce and losing 13 pounds, she was going to go for it! 1/13/10: Joyce is a 38-year-old advertising client manager for a local radio station. 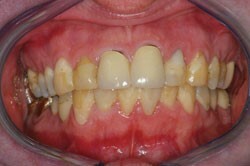 She had had a lifelong battle with dental decay that had seriously impacted her life. She came in as a new patient to the dental practice because she heard from a friend that they could “cure” her dental decay problems. Her previous dentist was recommending she consider dentures, but she didn’t want to lose all her teeth. She shared with her dental practitioner that she believes the poor esthetics of her teeth was one of the reasons her husband left her and that she believes her job might be in jeopardy due to her continued challenge of obtaining clients for the radio station. Her job is dependent on obtaining new advertising clients, and every time she would meet potential new clients face-to-face, they would seem to shy away the second she smiled. So she had simply stopped smiling altogether. Joyce had always dreamed of having a “perfect Hollywood” smile, but she had given up on dentistry because she had always had decay and kept getting new decay every time she had her teeth restored. She had tried every dental product she could find at the supermarket and online, even some toothpaste from Japan, but nothing had helped. Joyce’s caries risk assessment had three risk factors: frequent snacking, drinks other than water more than 2 times daily, and two or three medications daily. She loves to drink coffee and other caffeinated drinks like tea (she takes all her clients and potential clients to the local coffee shop) and had been taking oral contraceptives, a daily over-the-counter acid reflux medication, and ibuprofen for dental pain. Her CariScreen score was 9268, demonstrating a biofilm challenge, and she had obvious extensive active decay. Joyce wanted to know what her options were and asked her new dentist if she could be “cured” and have a “Hollywood smile,” or if dentures really were her only option. Her dentist explained that due to her high caries risk, placing esthetic restorations like crowns, bridges, and veneers was not a viable option at this time as the likelihood of failure was very high. But Joyce did have other options than dentures. The dentist shared that she was going to have one tooth removed as it was nonrestorable and indicated for extraction. 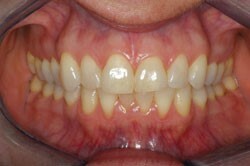 She had the option of having all of her necessary fillings done with a provisional “GIC” (glass ionomer cement) material that can act as a fluoride reservoir on her teeth while they worked together to design a plan to correct her oral biofilm imbalance with professional/prescription therapies and diet modification. Joyce was overjoyed that she had an option other than dentures but didn’t feel like she was ready to give up her coffee, and couldn’t change her necessary medications. 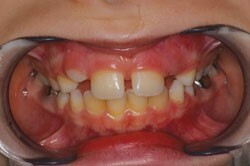 Her dentist suggested she use a medicated oral rinse and tooth gel twice daily with an antibacterial (0.2% sodium hypochlorite), 1.1% neutral sodium fluoride, xylitol, pH neutralization, and nanoparticles of hydroxyapatite for remineralization support (such as the 3 month supply CTx36 Kit). The dentist also suggested they make Joyce some “whitening trays” and that she wear the pH neutralizing gel with xylitol, nanoparticles of hydroxyapatite, and 1.1% neutral sodium fluoride in the trays at night while she slept. Joyce chose to move forward with the dentist’s recommendations for the extraction, GIC provisional restorations, and professional/prescription therapy products at home. She wanted to know at what point she would be able to move forward with cosmetic restorations and have a bright white smile. The dentist shared that, due to her condition and high risk, he wouldn’t feel comfortable placing those restorations until Joyce had multiple healthy appointments with no new decay (18–24 months healthy). Joyce said she was on a mission and agreed to the treatment plan. 6/22/10: Joyce returned for a 6-month cleaning appointment after having all of her restorations done with the provisional “GIC” material, the single tooth extracted, and using the recommended therapy products for 6 months at home. Her CariScreen score was 8338, and she still had the three risk factors of frequent snacking, drinks other than water more than 2 times daily, and daily medications (oral contraceptive and acid reflux medication). But she shared that she was not taking ibuprofen for dental pain any longer. Joyce had been diligent about her home care routine. She was rinsing twice daily with a rinse that contained an antibacterial (0.2% sodium hypochlorite), xylitol, pH neutralization (pH 11), and 0.05% fluoride. She then followed the rinse twice daily with a tooth gel that contained 1.1% neutral sodium fluoride, xylitol, pH neutralization (pH 9), and nanoparticles of hydroxyapatite (such as CTx4 Gel 5000, available from CariFree dentists). She was also wearing whitening trays with the same tooth gel in it at night. Her hygienist noted that her gums were much healthier, and Joyce said that they no longer bled when she flossed. Her dentist said that she had one small area of recurrent decay around a filling but multiple sites of remineralization and no new cavities. The dentist had to practically restrain Joyce from dancing in the operatory. Joyce was so happy, and after 20 minutes of joyful tears and hugs for the dental team, Joyce chose to have her recurrent decay repaired and continue with her home care program. 9/20/10: Joyce came in today for a check-up appointment, and nothing had changed with regard to her risk factors or home care program. Joyce continued to rinse and brush twice daily with the recommended products and wear the trays with gel in it at night. She did ask the dentist if her trays could be repaired as they had cracked in a few places from use. Her CariScreen score at this appointment was 3675, and her hygienist was so excited to see it coming down. She still had the three risk factors of frequent snacking, drinks other than water more than 2 times daily, and daily medications (oral contraceptive and acid reflux medication). 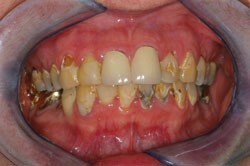 The dentist did a thorough examination and found no new or recurrent decay. Joyce was overjoyed and wanted to know if they could plan the cosmetic restorations she wanted. The dentist said that she was well on her way, and if she could keep her mouth in balance for another 12–18 months, they would present her with a treatment plan. Joyce chose to continue with her professional/prescription home care program. 8/23/11: Joyce came in today for a hygiene appointment, but it had been almost 12 months since her last appointment. She shared that her employer had laid her off, and while she had not been in for a cleaning and examination, she had continued to come in to the office to pick up her home care products and had not missed a day on the home care program. Her three risk factors of frequent snacking, drinks other than water more than 2 times daily, and daily medications (oral contraceptive and acid reflux medication) were still present. Her CariScreen score was 963, which is below the 1500 threshold. As she was paying out of pocket for this appointment, she was so relieved to hear that her investment in her home care program had paid off and that she had no new cavities and required no additional restorations. She informed her dentist that, at this time, she could not afford the cosmetic restorations she wanted but had a lead on a great job and was planning to be able to look into it in the next year. Her dentist said that he would like to see her continue her low-risk status with no new decay for another 12 months before they could begin that process anyway, and that she just needed to keep up her home care program with the rinse and gel that contained an antibacterial (0.2% sodium hypochlorite), fluoride, xylitol, pH neutralization, and nanoparticles of hydroxyapatite for remineralization support (such as CTx4 Treatment Rinse and CTx4 Gel 1100). But she no longer needed to wear the gel in a tray at night. She was committed to the program and so glad she had chosen to come to this dental practice and had saved her teeth and was no longer discussing dentures at all.